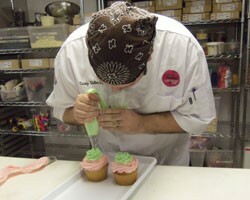 This is part three of Emily Wasserman's Chef's Choice profile of confectioner Casey Shiller of Jilly's Cupcake Bar. Part one can be found here. Part two, a Q&A with Shiller, is published here. Walking into Jilly's Cupcake Bar (8509 Delmar Boulevard, Ladue; 314-993-5455) is like walking into a proverbial minefield. Except instead of being bombarded by bullets or other hazardous items, your nose is invaded with the smell of freshly baked cakes, and your eyes will widen at the enormous selection of sinful treats. The bakeshop's "Everyday Delights" range from the "Bee Sting," a vanilla cake with honey lemon curd stuffing, to the Reese's, where Reese's Pieces cover practically every square inch of the peanut butter and chocolate buttercream swirl frosting. Guests can also sample executive pastry chef Casey Shiller's newest cupcake creations featured during Jilly's appearance on the Food Network's Cupcake Wars. 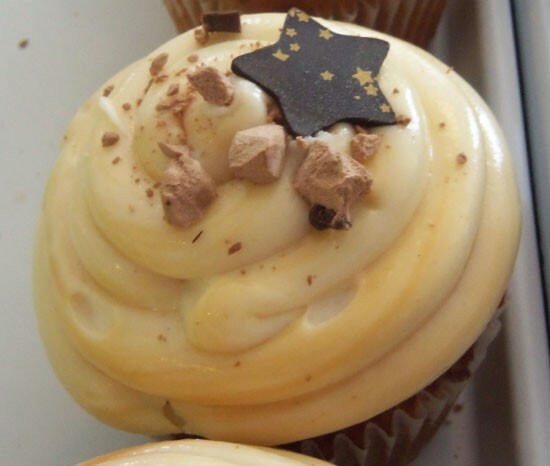 A standout favorite is the banana-toffee cupcake, known on the television show as the "Space Monkey." The soft, moist banana-toffee cake is filled with a crunchy, caramely dulce de leche center, and is topped with a generous portion of caramel cream cheese swirl and chocolate astronaut ice cream. In keeping with the War's mandated outer-space theme, a small chocolate star poses on top of the veritable mountain of sweet icing. This cupcake is not for the faint of heart, but then again, neither are the rest of Shiller's creations. If you've been searching for bananas foster rolled up into cupcake form, or just have been yearning for the melt-in-your-mouth taste of caramel, toffee and cream, look no further than this cupcake. Line a standard sized muffin pan with 12 cupcake liners. Combine the butter, sugar and brown sugar in the bowl of an electric stand mixer. Cream on medium-high speed using a paddle, until mixture is light and fluffy, about 5 minutes. Scrape down the bowl and add the egg and banana puree. Cream for an additional 3 minutes. Scrape down the bowl, then on low speed stir in the flour, baking powder, baking soda, salt and cinnamon. Let mix for 30 seconds on low speed. Add buttermilk and toffee bits. Stir on low speed until combined. Fill 12 cupcake liners 3/4-full with batter and bake until golden brown and baked through, about 25 minutes. Cool the cupcakes completely. Stir dulce de leche and toffee bits together until fully combined. Place in pastry bag with a round tip large enough to allow the toffee bits to pass through, without becoming lodged. In a bowl of an electric mixer fitted with a paddle, beat butter until light and fluffy on medium-high speed. Add cream cheese and mix on medium-high speed until well combined and lump-free. Scrape down sides of mixer bowl and add powdered sugar. Stir on low speed until well combined. Add vanilla extract, and beat on medium-high speed for 2 minutes. Remove from mixer and stir dulce de leche in by hand to create a marbled appearance. Place in pastry bag fitted with a large round tip. To assemble: Using an apple corer, remove center core of baked cupcake and fill with dulce de leche toffee filling. Pipe caramel cream cheese icing generously on top of cupcake. Using a paring knife, gently poke the chocolate astronaut ice cream to create separated chunks. Place four chunks on top of cupcake. Dredge outer rim of cupcake in miniature chocolate chips.